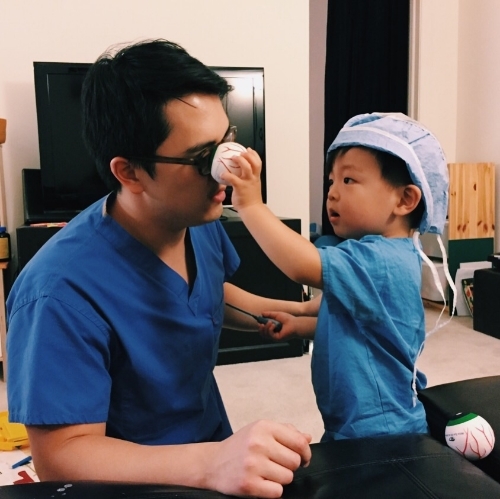 Getting some early instruction on being an ophthalmologist, just like daddy. In spirit of Father’s Day this weekend, we wanted to have a post highlighting the importance of fathers and all that they do. While mothers may still tend to get the brunt of parental duty and scrutiny (and are still underappreciated! ), fathers are equally as important of a parent. We as a society don’t value fathers enough, who have historically been solely seen as the uninvolved breadwinner or disciplinarian. However, fathers now desire to be actively involved their children’s lives. After all, they are parents--not the babysitter. As the roles of mothers and fathers are converging more and parenting and household duties are becoming more evenly distributed, fathers are increasingly important to the household, especially as the number of stay-at-home dads increases. Work-family balance is equally important to both parents, and some fathers have the option of taking parental leave after their child is born. Facebook COO Sheryl Sandberg has talked about the importance of having a supportive spouse in her book, Lean In, and has tragically felt what it was like to lose that support. There are so many different family dynamics, and a happy, complete family does not necessarily include a father. But those where fathers are present, can benefit so much from them. Fathers are so important in being good examples for both sons and daughters. While sons will use their dads as the prime example of what it means to be a man, spouse, and father, daughters will just the same see their dads as an example of what a husband and father should be. I know I am so blessed to have a wonderful relationship with my dad, and I have absolutely loved seeing my husband become a father. I remember when I was younger my mother said I would marry someone like my dad, and I do see some overlap in their characteristics. Even when we were dating, I could imagine that my husband would be a great father. As a mother of two now, I know that it would be infinitely harder to get through life without my husband by my side. I already see how my son’s personality is like both of us, but I know some of the sweetest things about him are straight from his dad. My husband is so special to our family, and I don’t even want to think about what it would be like without him! How are you showing the fathers in your life how you appreciate them?